Thinking they had the next Bo Jackson, the Cardinals turned down the chance to draft Frank Thomas. In the first round of the June 1989 baseball draft, the Cardinals, with the sixth pick, selected outfielder Paul Coleman of Frankston (Texas) High School. With the next pick, No. 7, the White Sox chose Thomas, a first baseman from Auburn University. Thomas, a two-time winner of the American League Most Valuable Player Award, was elected to the National Baseball Hall of Fame on Jan. 8, 2014. Playing for the White Sox, Blue Jays and Athletics from 1990-2008, Thomas hit .301 with 521 home runs and 1,704 RBI in his big-league career. Coleman never reached the major leagues. 1. Ben McDonald, pitcher, Orioles. 2. Tyler Houston, catcher, Braves. 3. Roger Salkeld, pitcher, Mariners. 4. Jeff Jackson, outfielder, Phillies. 5. Donald Harris, outfielder, Rangers. 6. Paul Coleman, outfielder, Cardinals. 7. Frank Thomas, first baseman, White Sox. All except Jackson and Coleman played in the big leagues. Only Thomas made the Hall of Fame. The Cardinals rated Coleman the fifth-best player in the draft, the St. Louis Post-Dispatch reported, and felt fortunate he was available at No. 6. Coleman, 5 feet 11 and 215 pounds, hit .498 with 39 home runs in his high school career. 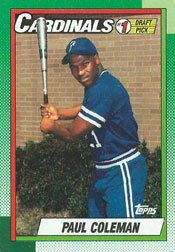 A right-handed batter, Coleman had 119 RBI in 93 high school games. As a senior, he was successful on all 25 of his stolen base attempts. He was 63-for-67 in steal attempts during his prep career. Coleman, the first outfielder chosen by the Cardinals in the first round since Andy Van Slyke in 1979, was delighted to be taken so early by St. Louis. “I lost my breath when I heard,” he said. Coleman spent five years in the Cardinals’ minor-league system, never advancing beyond Class AA. His best professional season was in 1993 with the Cardinals’ Arkansas club in the Texas League. Playing for manager Joe Pettini as part of an outfield with John Mabry and Allen Battle, Coleman hit .244 with 24 doubles, seven home runs and 30 RBI in 123 games. Thomas, 6 feet 5 and 240 pounds, hit .403 with 19 home runs and 83 RBI for Auburn in 1989. A year later, Aug. 2, 1990, Thomas made his big-league debut with the White Sox.